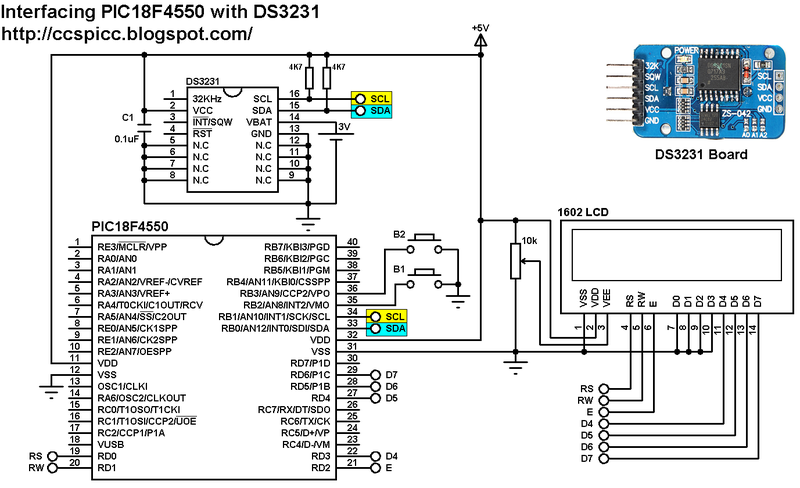 The DS3231 is a low cost , extremely accurate real time clock with a built-in crystal oscillator. 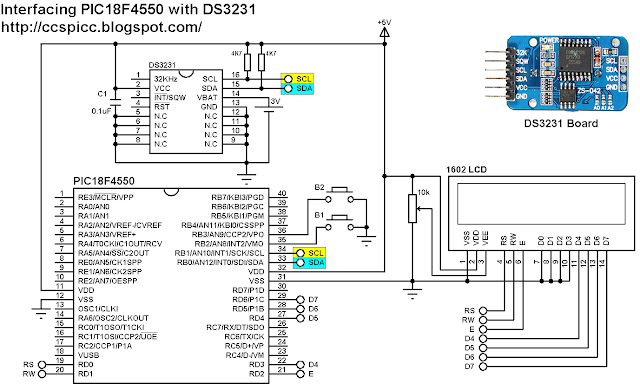 The characteristics of the DS3231 make it one of the best choices for real time clock chips. This project shows how to build is simple real time clock and calendar (RTCC) using PIC18F4550 microcontroller and DS3231. The DS3231 uses I2C protocol to interface with the master device which is in our example the PIC18F4550 which has one I2C module. The I2C protocol uses only two lines: SCL (Serial Clock) and SDA (Serial Data) which are in the PIC18F4550 pin RB1 and pin RB0 respectively. The 1602 LCD has 7 data lines which are connected to pins RD0~6, the DS3231 SCL pin is connected to pin RB1 (#34) and SDA is connected to pin RB0 (#33) of the PIC18F4550 microcontroller. In the circuit there are 2 push buttons (B1 & B2) connected to pin RB2 and pin RB3, the two push buttons are used to set the time as well as the calendar parameters (minutes, hours, date......). The button B1 selects the parameter and B2 increments the selected parameter. 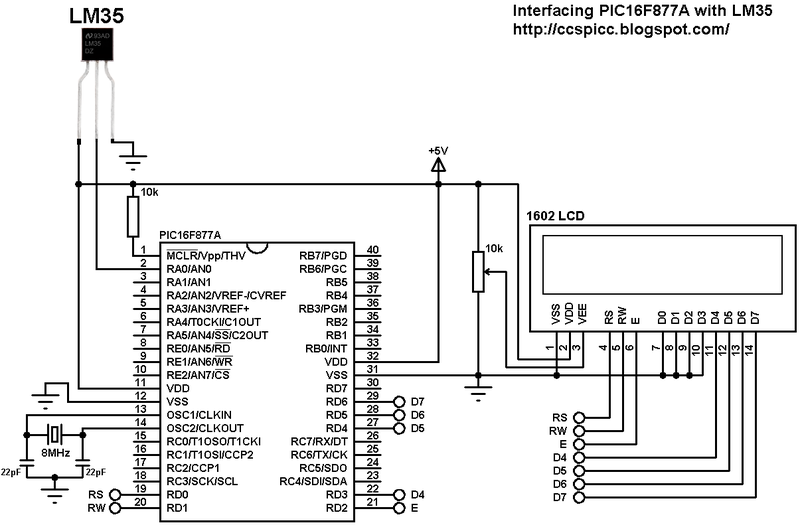 In this project the PIC18F4550 uses its internal oscillator and MCLR pin function is disabled. 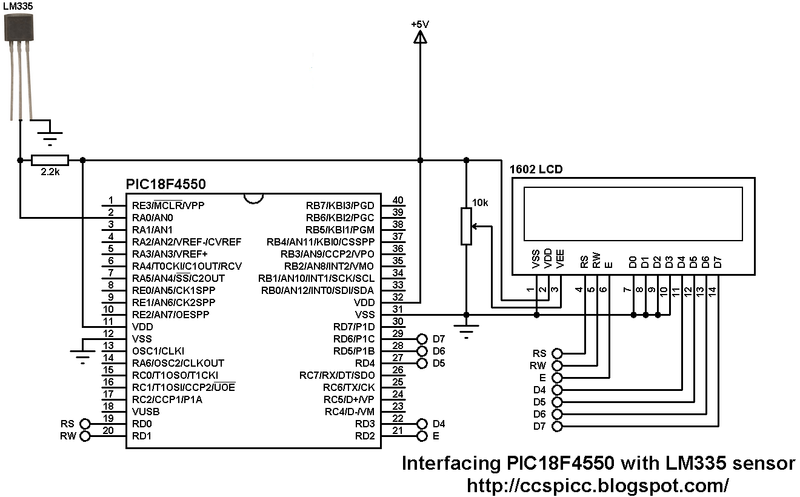 I2C1: use first I2C module. void DS3231_display() : this function prints the time and calendar on the 1602 LCD screen. Before the print it converts the all the wanted data from BCD format to decimal format. i = 2, 3, 4: date, month and year respectively. After the edit of time/calendar the data have to be converted back to BCD format and written to the DS3231 (it had been converted from BCD format to decimal format by the function void DS3231_display() ). void blink() : this small function works as a delay except that it is interrupted by the buttons B1 (connected to RB2) and B2 (connected to RB3). When called and without pressing any button the total time is 10 x 25ms = 250ms. With this function we can see the blinking of the selected parameter with a frequency of 2Hz. So a delay of 250ms comes after the print of the selected parameter and after that delay a 2 spaces is printed which makes the parameter disappears from the LCD and another 250ms delay comes after the print of the 2 spaces. The complete C code is the one below. 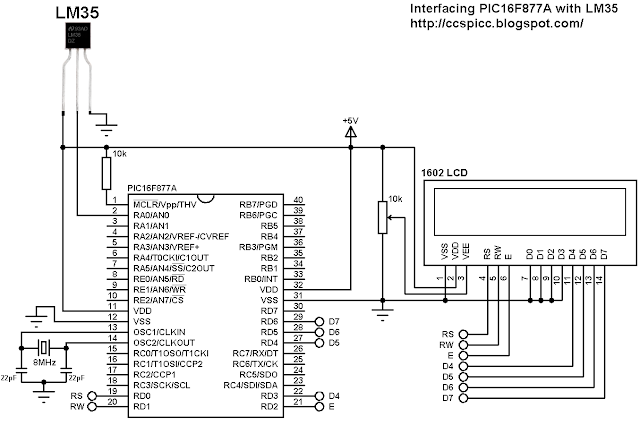 /* Real time clock/calendar (RTCC) using PIC18F4550 & DS3231 CCS C code. Time & date parameters can be set using two push buttons connected to RB2 & RB3. The project should work as shown in the video below (in the video the used mcu is PIC16F877A). As mentioned above, the LM335 is a 3-pin analog device which can measure temperature (converts temperature to analog voltage). This sensor requires an ADC to convert the analog data into digital one. 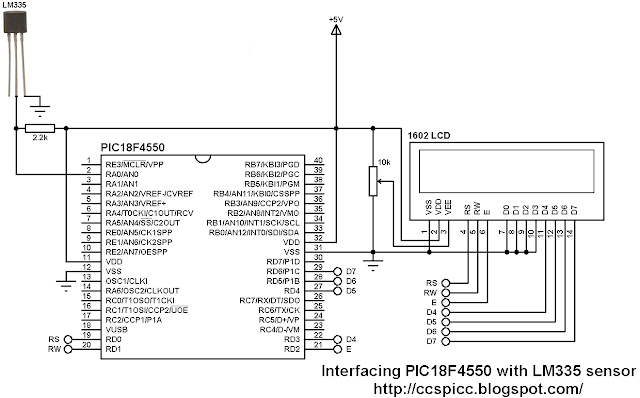 this topic shows how to use PIC18F4550 microcontroller ADC module to measure the ambient temperature using the LM335 sensor. The LM135 has a breakdown voltage directly proportional to absolute temperature at 10 mV/°K. If the LM335 output voltage for example is 3.03 (3030 mV) that means the temperature is: 303 °Kelvin = 30 °Celsius. The output pin of the LM335 sensor is connected to analog channel 0 (AN0). I chose the 2.2K ohm because as written in the datasheet for optimum accuracy the current flows through the LM335 should be 1mA. For example if the temperature = 27°C, the output will be 3.00V and assume the supply voltage is exactly 5.00V that means the current flows through the sensor is ( 5 - 3)/2.2 = 0.90mA which is good enough. Also the value 2.2K is a standard value and well used. The 1602 LCD screen is connected to pins RD0~6. The 10K variable resistor is used to adjust the brightness of the screen. In this example the PIC18F4550 runs with its internal oscillator @ 8MHz and MCLR pin function is disabled. 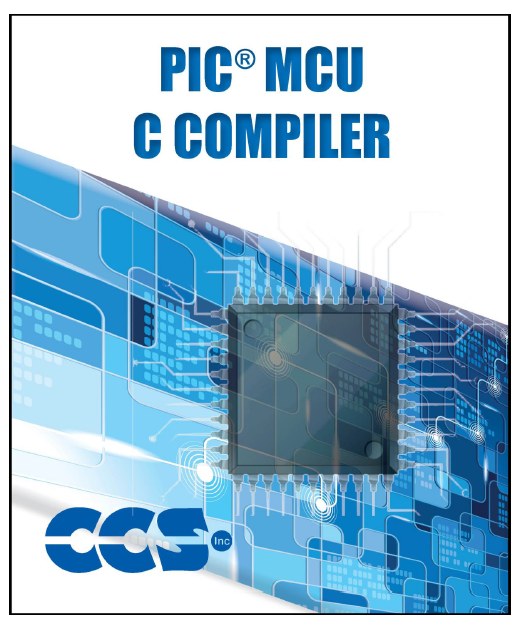 The following C code was tested with CCS PIC C compiler version 5.051. /* Interfacing PIC18F4550 with LM335 analog temperature sensor CCS C code. Read LM335 datasheet to understand the code! After I built a simple real time clock and calendar using PIC16F877A microcontroller and DS3231 RTC boards, I improved the previous project and I added alarm functions (alarm1 and alarm2) and temperature monitor. The DS3231 RTC has a built-in 2 alarm functions and a digital temperature sensor with an accuracy of ±3°C. To simplify the circuit, I used the DS3231 board, this board basically contains the main chip which is the DS3231, pull-up resistors (4.7K) of SCL, SDA and INT/SQW lines and coin cell battery holder. There is also 24C32 EEPROM and some other resistors (not used in this project). The DS3231 board is supplied with 5V as the microcontroller and the 2004 LCD, there are 3 data lined connected between this board and the PIC16F877A, SCL line is connected to RC3, SDA is connected to RC4 and INT line is connected to pin RB0 which is the external interrupt pin of the PIC16F877A. The DS3231 interrupts the microcontroller when there is an alarm. In the circuit there are 3 push buttons: B1, B2 and B3. These buttons are used to set time, calendar and alarms. Time and calendar can be adjusted with B1 and B2, button B1 selects time or date parameter (time parameters: hours and minutes; calendar parameters: day, date, month and year) and B2 increments the selected parameter. The button B3 and B2 adjust alarm1 and alarm2 parameters (hours, minutes and ON/OFF), button B3 selects the parameter and B2 increments the selected parameter. 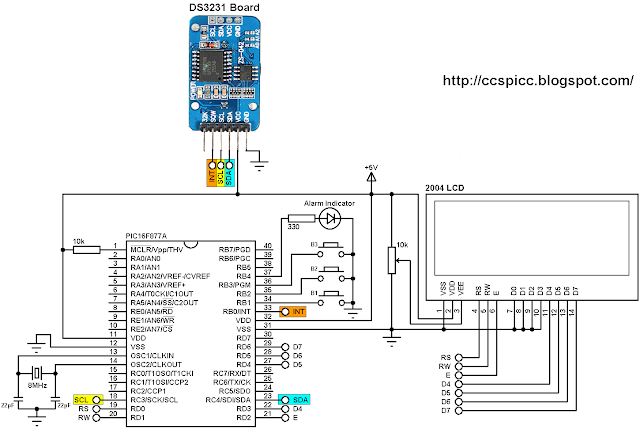 There is an LED connected to pin RB4, this LED is used as an alarm indicator, so if there is an alarm the DS3231 pulls down the INT pin which interrupts the microcontroller and the microcontroller turns the LED ON, here button B2 turns both the LED and the occurred alarm OFF. In this project the MCU runs with 8MHz crystal oscillator. The C code below was tested with CCS PIC C compiler version 5.051. By reading the datasheet of the DS3231 RTC the code will be more easier! void DS3231_read() : this function reads time and calendar data from the DS3231 (seconds, minutes, hours, day, date, month and year). void DS3231_display() : displays time and calendar data, before displaying time and calendar data are converted from BCD format to decimal format. This function displays the calendar by calling a function named void calendar_display() . void alarms_read_display() : basically this functions reads alarm1 and alarm2 minutes and hours. It also reads the DS3231 control register, status register and 2 temperature registers. The other job of this function is to display alarms data (hours, minutes and status) and the temperature value. The alarm status are extracted from the control register. After the edit of time/calendar/alarms the data have to be converted back to BCD format and written to the DS3231. alarm1_status and alarm2_status are 1-bit variables, for example if alarm1_status is 1 ==> alarm1 is ON and if alarm1_status is 0 ==> alarm1 is OFF. The same thing for alarm2. PIC16F877A & DS3231 CCS C code. Time & date parameters can be set using two push buttons connected to RB1 & RB2. Alarm1 and alarm2 can be set using buttons RB3 and RB2. turn the occurred alarm OFF. DS3231 interrupt pin is connected to PIC16F877A interrupt pin RB0. The following video shows a simple hardware circuit of the project. And the second video shows a simulation of the project with Proteus. The LM35 temperature sensor is three pin device (VCC, OUT and GND) with an output voltage linearly related to Centigrade temperature. Since the LM35 output varies with dependent to the temperature we need ADC (Analog-to-Digital Converter) module to measure this voltage. The ADC module converts analog data into digital data. This topic shows how to interface the microcontroller PIC16F877A with LM35 analog temperature sensor. The output of the LM35 temperature sensor is connected to analog channel 0 (AN0) of the PIC16F877A. In this example the microcontroller runs with crystal oscillator @ 8MHz. /* Interfacing PIC16F877A with LM35 analog temperature sensor CCS C code. Read LM35 datasheet to understand the code! The video below shows a simple hardware circuit of our example. And the following video shows the simulation.